The expectations of US citizens — as consumers of government services — continue to increase and shift as digital and social channels transform communications, interactions, and the delivery of services. These expectations are perhaps even more pronounced at the state and local level as citizens engage frequently with governments in the states and local communities in which they live. To optimize the technology and human resources involved in delivery of Citizen Services, state and local governments across North America are embarking upon digital transformation journeys — modernizing IT applications and infrastructure. How are governments planning for and executing upon this transformation and what barriers do they face in completing this journey? To understand the answers, Unisys commissioned Market Connections to find out. 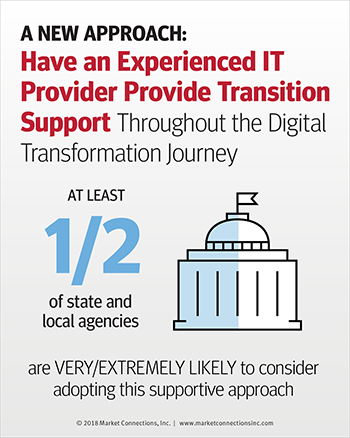 The study captured the perspectives of US government executives around the adaption and adoption of digital technologies to advance the digital transformation initiative and agendas in their states. Fill out the form below to download the whitepaper and infographics.